Telerik RadControls provide a very powerful ContextMenu control, that supports right click, modifier keys and that can be easily attached to any visual element. 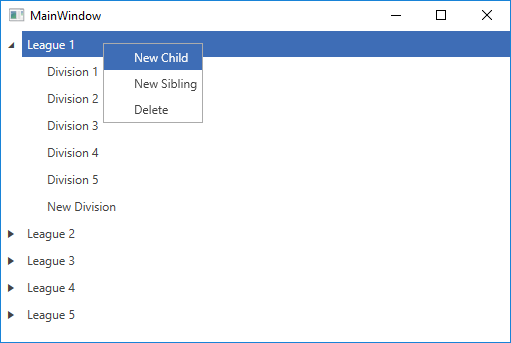 In this article you will see how to attach RadContextMenu to a data-bound RadTreeView and perform actions on the clicked treeview items, depending on the selection in the context menu. The local alias is pointing to the namespace where the RadTreeViewSampleData class is defined. For more information about setting the ItemsSource property and data binding read the topic about Binding to Object. The AddHandler() extension method is defined in the Telerik.Windows namespace. You should add “using Telerik.Windows;” on top of your code behind if you don’t already have it.